June—Aug. 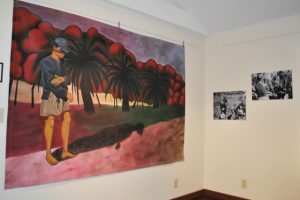 2017— Long Shadow: Memories of Vietnam The series consists of six mural-sized acrylic paintings on canvas based on memories and photos David Giffey took as a combat journalist with the Army 1st Infantry Division during the war in Vietnam. Other photographs and captions accompany the exhibit. 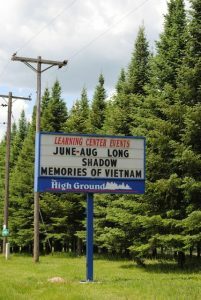 The Long Shadow series of paintings and photos by David Giffey, member of Chapter 25 Veterans for Peace, will be exhibited through August 30, 2017, at The Highground veterans’ memorial park, Neillsville, Wisconsin. Giffey also designed the dove mound earth sculpture built at The Highground in 1989.
completed between 1991 to 2013. The Highground is placed in the center of the State of Wisconsin so that the location is a days trip away from any location in the state. Please view the directions for the best way to get to us. Please note that if you were using a GPS we strongly encourage you to follow our route as the GPS unit will want to take you down a different path. See this page on their website for directions. This entry was posted in The Highground, Veterans for Peace and tagged 1st infantry, Chapter 25, Combat Journalist, David Giffey, Dove Mound, Learning Center, Long Shadow, Neillsville, The Highground, U.S. Army, Veterans for Peace, VFP, Viet Nam, Vietnam, Wisconsin on June 12, 2017 by Website Administrator.